Ernst Troeltsch focuses his Protestantism and Progress on two main areas. First, he centers on the intellectual and religious situation, from which the significance and the possibilities of development possessed by Christianity might be deduced. This leads to an engaging historical investigation regarding the spirit of the modern world. Troeltsch argues that the modern world can only be understood in the light of its relation to earlier epochs of Christian civilization in Europe. 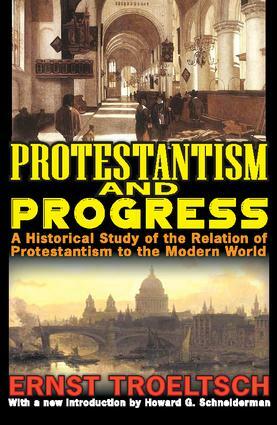 He notes that for anyone who holds the opinion that in spite of all the significance that Catholicism retains, the living possibilities of development and progress are to be found on Protestant soil, the question regarding the relation of Protestantism to modern civilization becomes of central importance.Troeltsch also distinguishes elements in modern civilization that have proven their value from those which are merely temporary and lead nowhere. He gives the religious ideas of Christianity a shape and form capable of doing justice to the absoluteness of religious conviction, and at the same time considering them in harmony with what has actually been accomplished towards solution of the practical problems of the Christian life.A new introduction by Howard Schneiderman brings this monumental work into the twenty-first century, and explains why its ideas are more important than ever, one hundred years after its original publication.